Moorestown High School sophomore Caroline Brinkman, senior Gianna Jarmain and senior Olivia Coffey headed to Sarasota, Fla. to compete at the U.S. Rowing Youth Regional Challenge. 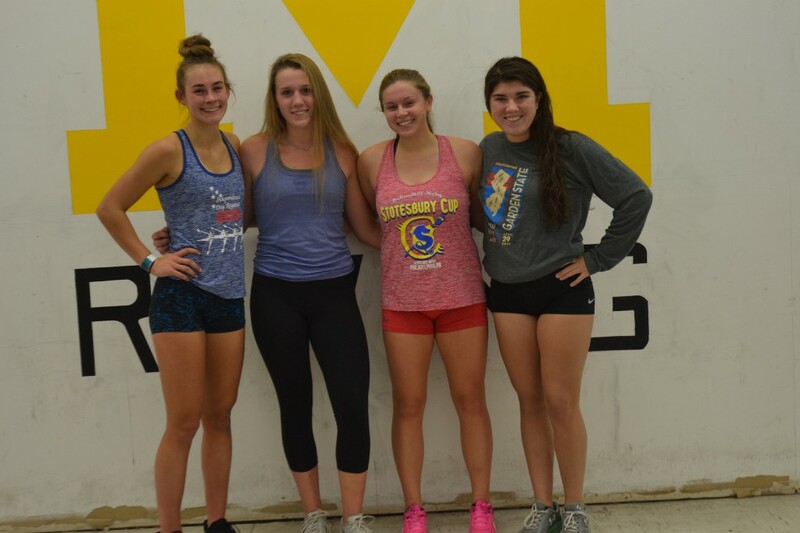 Four of Moorestown Crew’s female rowers qualified to compete at the U.S. Rowing Youth Regional Challenge in Sarasota, Fla.this December. From left to right: Caroline Brinkman, Grace Bischoff, Gianna Jarmain and Olivia Coffey. The Cooper won’t unthaw until spring, but three of the rowing club’s girls were readying for a weekend spent in a bit warmer climate. On Wednesday, Dec. 12, Moorestown High School sophomore Caroline Brinkman, senior Gianna Jarmain and senior Olivia Coffey headed to Sarasota, Fla., to compete at the U.S. Rowing Youth Regional Challenge. From Dec. 13 to Dec. 15, the event brought together more than 400 athletes and 36 coaches from six USRowing regions for a three-day camp and regatta. On Thursday and Friday, the girls attended practices while on Saturday the girls raced. Last year, Coffey was the sole member of Moorestown Crew to attend the inaugural event. Coach Harry Carroll said once Coffey competed, it was like a ripple effect. He said other girls saw Coffey compete and wanted to do the same. In preparation for the competition, the Regional Challenge coaches sent home workouts for the girls and asked them to send in their scores. Additionally, at the end of November, they held a practice in Virginia to get the athletes an opportunity to meet their regional boatmates. Jarmain said their focus isn’t so much on competition. She said one of the most important parts of the sport is to simultaneously have the ability to push yourself and to motivate your teammates. Brinkman said the winter months can often be a difficult time for rowers. She said months on end on the erg, but it’s all about maintaining the right attitude. She said remembering the feeling of flying on the water has gotten her through some of her more difficult workouts. For MHS junior Grace Bischoff, who is coming off an injury, the light is nearly in sight. Bischoff has been dealing with a shoulder injury since July. Her times also qualified her to compete in Sarasota, but her injuries are just now nearly on the mend. She joined team practices once again Monday, Dec. 11, and thought better than to push her injury by jumping into the competition. Despite the injury, Bischoff still sees having four rowers qualify as a step in the right direction for the team. Coffey said last year’s inaugural event last wasn’t about competition. In fact, no medals were handed out to the winning boats. The challenge offered her an opportunity to meet and connect with rowers from around the country and was an overall encouraging experience. Approximately 100 more athletes will be in attendance at this year’s event, and Coffey said, headed into the competition, she just looked forward to coming together with other rowers to make their boat the best that it could be. “I just think being able to come together, being able to work together as a boat is really cool,” Coffey said.